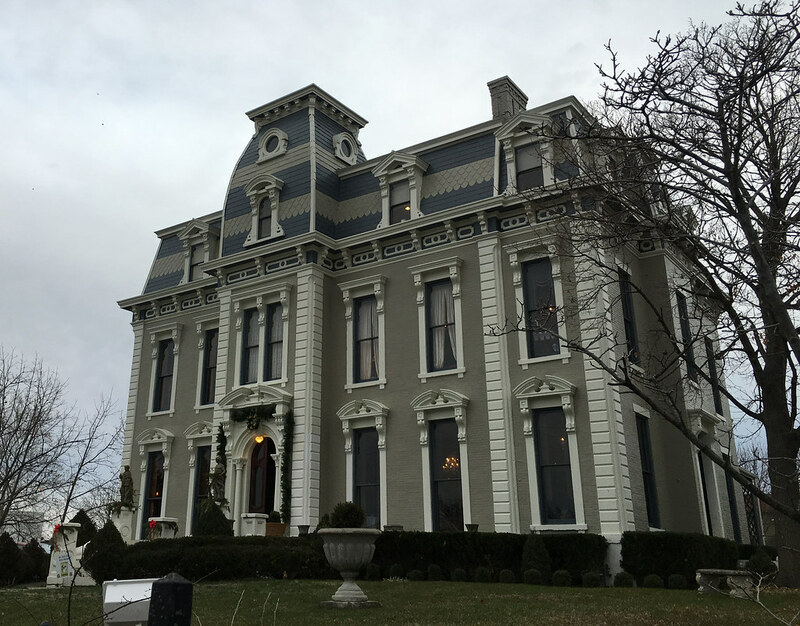 This past weekend, I attended a holiday homes tour in the St. Anne’s Hill historic district of Dayton. They hold their “Dickens of a Christmas Holiday Home Tour” fundraiser every other year (and in the other year they do a spring tour). You have a guided tour through the neighborhood, along with admittance to 6 or so beautifully decorated and cared for historic homes, mostly Victorian era. The tour wraps up with delicious bread pudding inside the well-known Bossler Mansion on Dutoit Street. I had been on the Christmas tour once before (in 2011, I think it was), but the homes change from year to year, and it is worth repeating. I was particularly enticed to attend the tour this year because it was approximately 60 degrees, unlike the chilling cold and snow/freezing rain that I walked in last time. (Our poor tour guides in their Victorian winter dresses and capes were sweating it though!) I also chose a daytime tour this time, instead of an evening one, which made it easier to see what I was looking at outside! You’re probably wondering what I came here to write about, if I’m not going to tell-all on tour details or show you photos of these gorgeous old houses in all their magnificence. Well, there were a few snippets I want to share — these things that have stuck with me, following the tour. Most of these things have to do with the homes’ “stories” (you know how I love stories). In the interest of privacy, I will try not to “out” the owners or the house precisely, though if you were part of the tour (or are a member of the close-knit neighborhood), you’d likely be able to figure it out. When you first enter each home, the owners usually have a brief introduction to share with you about the house — what they know about its history, what has been done to restore it, etc. In one of these stories, the owner mentioned that his home had been lived in for several decades by a pair of unmarried sisters, prior to his acquisition of it. He said they didn’t do anything to the house for most of that time. So, on the one hand, they hadn’t made any improvements, but on the other hand, they also didn’t do anything BAD either. They just didn’t do anything, really…so they didn’t screw it up! This story made me think of my Dad. I feel like I’ve heard him make a similar statement. The historic home I lived in when I was little (described in the previous blog post) had been occupied for decades only by two spinster sisters, whose father had the house built so it had only ever been in 1 family for its entire life of about 80 years. When my Dad got it, not a lot had been done to it over the years. Nothing good. But also nothing bad. People do a lot of interesting things to houses, historic or not. The older the house, the wider the window of opportunity has been for someone to have done something interesting to it. Now, my high school best friend and I had an inside joke about the word “interesting.” One of us would say something was “interesting,” and the other would say, “Interesting like chocolate-covered grasshoppers, or interesting like So-and-So’s hair?” One was good, the other bad. (I’ll let you guess which was which.) But the point is, yes…sometimes people do good things to houses, and sometimes people do bad things. Now of course, the homes we saw on the tour were all full of interesting good things. They’ve been loved — and lived in, some for 150+ years. Some had been “rescue” jobs, but they’re looking pretty good now (wonderful even!). Anyway, the point is — all of these homes, whatever their past, they are now being lovingly cared for by people who wanted a historic house to love and care for. Believe it or not, that’s actually not quite where I’m going with my whole “kindred spirits” thing. I love old houses…to look at. I love to look at them. But I’m not sure I would love many of the realities of actually living in one. I want insulation and drywall and central air and brand new electric. Yeah yeah, I know you can put all these things into old houses, but it’s a lot harder. One thing I remember thinking in that house was how much fun I think my uncles would have if I turned them loose on creating beautiful ornate woodwork that was actually new but made to look old. (Now would probably be a good time to tell you that my uncles are extremely talented finish carpenters as well as general contractors.) Or, maybe they would look at me like I was crazy. We’ll probably never know. The house with the drywall and the 1850s staircase also featured a Christmas tree with a train running in a circle under it. The man said his father bought him that train for Christmas in 1949. “I was seven months old,” he said with a grin, “so you tell me who really wanted to play with a train.” That reminded me of Dad. And as if I needed another reason to like these people who had brought a 150-year-old house back from the brink and made it beautiful again, I noticed a copy of David McCullough’s The Wright Brothers on an end table. Kindred spirits, indeed. At another house, addressing us from a few steps up the staircase (as most of them did if there was a staircase in the front hall, which was many of them), the owner started off by saying that when they agreed to be part of the tour, they actually didn’t really know anything about the home’s history (and they hadn’t been the ones to restore it either), so she wasn’t sure what she would tell us for the introduction. Out of the blue, the great-granddaughter of some previous owners, who had lived in the home for 50 years and raised several children there, had written to them, with memories of the house and pictures. But not everybody would care about something like that. Some people might not be interested in receiving such a thing. And far more people would even think to write such a thing, let alone actually do it. Some might even call it crazy. But not me. And not that woman telling us the story from her staircase. And I dare say not the other 30 or so tour-goers standing around me, making the same murmurs of awe that I was making. So, standing in that crowded living room, hearing that story and mentally telling myself don’t cry in public don’t cry in public (and I succeeded), I think that was the moment that gave me the “kindred spirits” feeling I used in the title. Historic homes people? People who love them and live in them? People who love them enough to drop $22 for a chance to see inside just a few? Yep, these are my people, and this is our jam. At one of the last houses on the tour, the couple who lived there had actually gotten into character, portraying the Victorian doctor and his wife who had previously lived in their house. That in and of itself was great, and they both looked fantastic. They even had a little exhibit on “quack” Victorian medicine! But something about the wife kept giving me this de ja vu feeling. I couldn’t figure out what it was. Even her name seemed familiar to me. I noticed a certificate on the wall with her name on it and checked it out to see what it was for, thinking perhaps she was a fellow library professional or something like that, who I might have heard of somewhere. Nope, totally different profession. I thought maybe she was someone I had helped when I worked at Dayton Metro Library, as I did a lot more reference desk work there than I do now; I saw a lot more people, I’m sure. It’s a pretty cool experience any time you get to see the amazing results of something that you, as a librarian or archivist, “helped” with — whether it’s a published book, a school project, or in this case…a performance! That was actually the anecdote that first occurred to me as something I wanted to write about here…and then I thought of the others. And finally, without further adieu, no post centering on the St. Anne’s Hill Dickens of a Christmas holiday homes tour would be complete without a mention of the spectacular Bossler Mansion. And that I have a couple of pictures of. So I’ll just leave you with that. This entry was posted in Editorials and tagged archives, historic homes, historic houses, history. Bookmark the permalink. Yes, I remember you! Thank you for helping me at Wright State. That library is INCREDIBLE. I would love to contact you about a few other projects I am working on. You’re welcome! Glad we could help! And you guys did a great job with what you found! Sure you can email me at lisa.rickey@wright.edu.